Andrew's guilty pleasure involves swaying to hits of the 80's such as George Michael's seminal art piece, Careless Whisper. Unfortunately, his guilty feet have got no rhythm. He can usually be found laughing among friends or shushing them in a cinema. 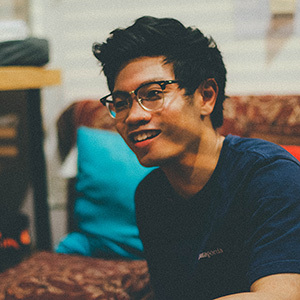 Being a fresh political science and sociology graduate, Andrew's refusal to give up on the university lifestyle has resulted in him continuing to hang around campus as a ministry intern with the university's campus ministry. He is partial to great Mexican food and rejoices in its scarcity in his part of the world, knowing that it's a reminder not to get too attached to this life but to look forward to the new creation.